UPDATE 11/15/16: The date for the encore event featuring Ms. Matthews has been changed from December 1, 2016 to January 10, 2017 at the Lake Theater & Cafe in Lake Oswego. More details to be posted soon! 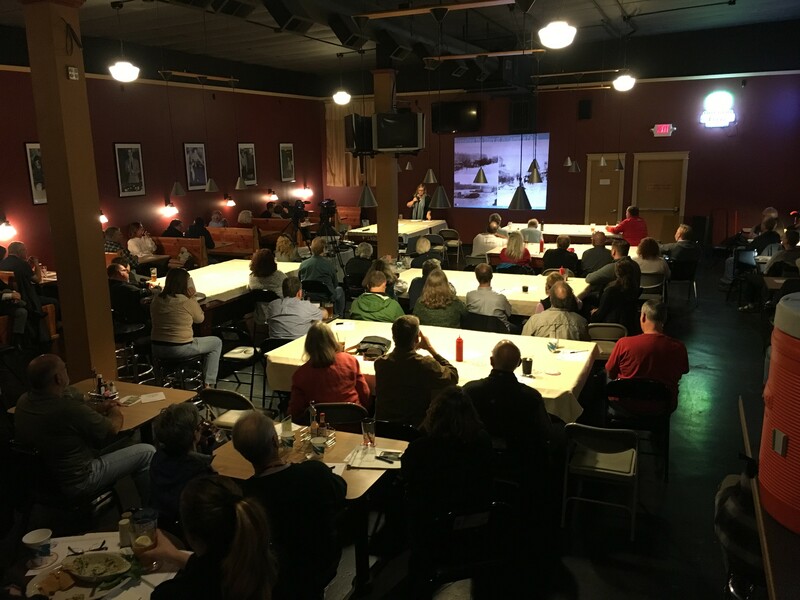 An enthusiastic crowd gathered at the Midway Historic Public House in Oregon City on October 12 to hear from Laurie Mathews, an award-winning preservation planner, designer and cultural landscape historian. 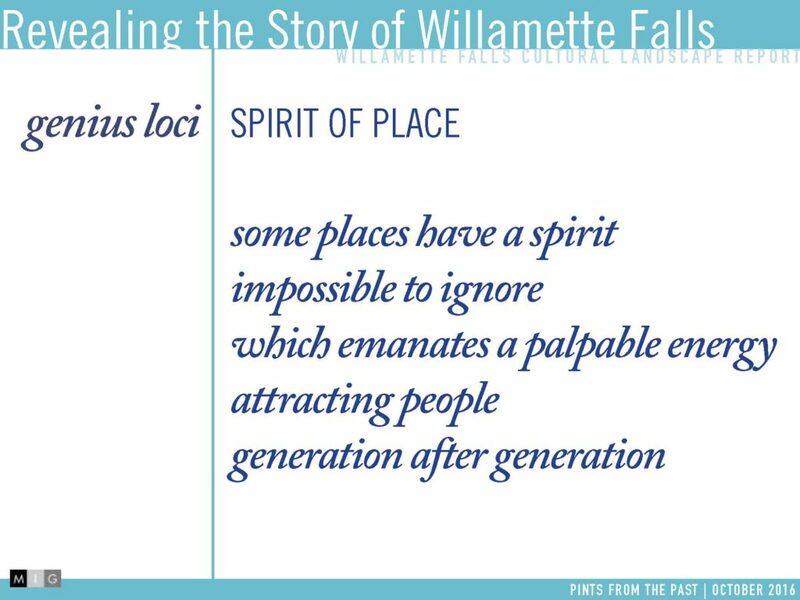 Ms. Mathews shared vignettes from her work to create a cultural landscape report for the Willamette Falls Legacy Project. She discussed how Cultural Landscape Reports focus on the story of place which includes some aspects of the people who shape it, but the primary focus is on historic events that are tied to place or that illustrate how a place has changed over time. Ms. Mathews described herself and the work she does as landscape historian or detective – a vessel for stories and information about place that have been documented in the historic record. "It’s my task to make connections between diaries, newspaper articles, books, maps, illustrations, paintings, photographs, oral recordings, etc. to piece together the story or transformation of a place." Ms. Mathews is fascinated by this dynamic site and the layers of history embedded in the story of a place. "This site – consisting of multiple layers of history for our region and our state possesses many layers. It’s about our people and stories: the American Indians, the early settlers and industrialists, our workers and families. It’s about our natural history and resources: the Columbia basalt flows that poured from over Oregon on their way to the Pacific Ocean and the Missoula Flood that gave us our rivers and valleys; it’s about sustenance: fishing for Chinook, harvesting lamprey, providing hydropower and electricity, having jobs with sustaining wages. 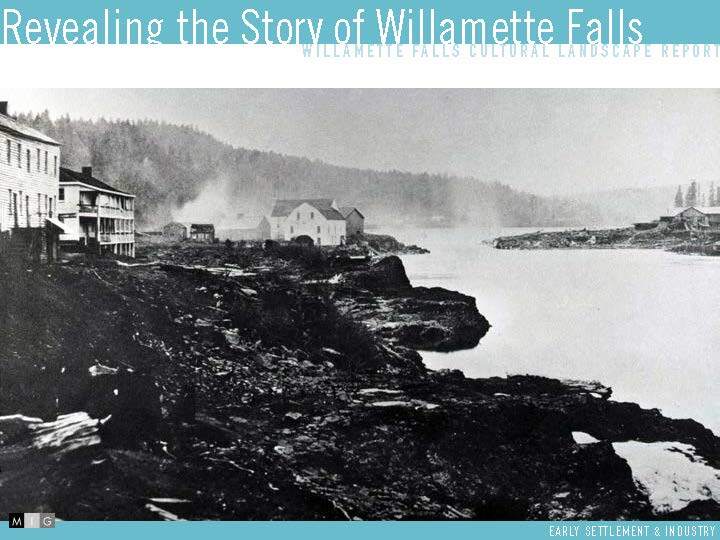 And it’s about this as a gathering place: coming together as members of an Indian nation, as a community, as a place for visitors to understand the Oregon legacy and what has drawn people here, to Willamette Falls." The Cultural Landscape Report will be further refined this winter with a draft expected in early spring. The knowledge and insights in the report will be used to inform riverwalk design, construction and interpretation. The audience at Pints from the Past was asked to share their thoughts on a few questions. We'll share some of the community's responses in a future post. Meanwhile, we'd love to hear what you think! What do you see as the biggest or most important opportunities for historical and cultural storytelling on the Blue Heron Mill site? Do you have an example of a place, event or performance that powerfully told a story in ways you did not expect? Why was this powerful to you? The presentation was recorded by Willamette Falls Media Center and will be available on our website 1-2 weeks from the event.